The worst ones for me happen in the middle of the night. I wake up feeling panicked. All focus on my leg. As Fergal would say… Ouchies! Normally I’m not a fan of the nutritionist approach to thinking about food in terms of nutrients. Like counting calories it takes the joy out of eating. I prefer to focus on getting as much variety as I can from whole foods. So much easier and more delicious! But I do have 2 exceptions. Iron and magnesium. As I wrote recently, when I’m feeling tired (especially during pregnancy), I find upping my intake of iron rich foods makes an amazing difference. The second exception is, you guessed it, magnesium for cramps. So what are the best food sources of magnesium? 1. Cocoa Powder or Dark Chocolate. By far the best source. Ever wondered why women tend to crave chocolate at that time of the month? To be honest this is my go-to when cramps are getting to me. I just have a square of dark chocolate (90% cocoa solids) after dinner. Pepitas (pumpkin seeds) are the best. Brazil nuts, sunflower seeds, almonds, pinenuts, cashews and sesame seeds are also good. Especially oily fish like salmon and mackerel. Is there anything leafy greens can’t do? Think spinach, chard, silverbeet and kale. See this list for other sources. Which brings me to this weeks recipe! The name of this dish doesn’t do it justice. I love how the tahini and lemon juice make an instant tasty sauce for the fish. And how the pepitas provide crunch and some pretty visual interest. I also love cooking fish this way because you don’t have to think (as long as you remember to set your timer!) and it avoids your kitchen smelling fishy. 1. Preheat your oven to 250C (480F). 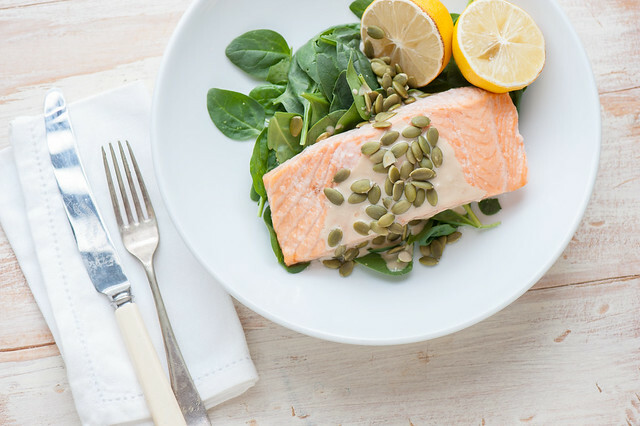 Place salmon in an oven proof dish or tray and roast for 10 minutes or until cooked to your liking. 2. 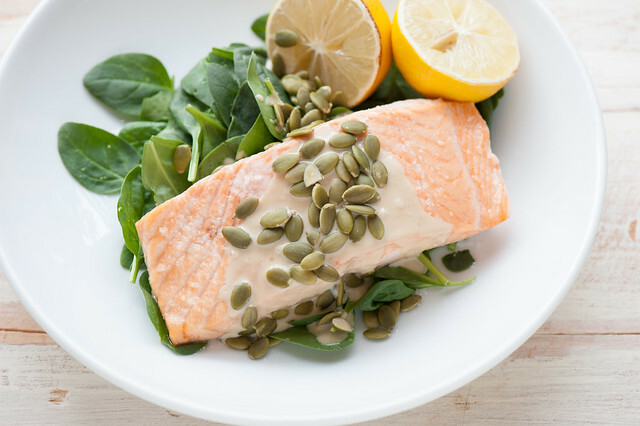 Serve salmon on a bed of baby spinach. Drizzle with tahini and scatter over pepitas and finish with lots of sea salt and black pepper. Serve lemon on the side. vegetarian / vegan – replace salmon with cooked or canned black eye peas, beans, chickpeas or lentils warmed in a little olive oil. seed-free – replace tahini with a drizzle of tangy natural yoghurt (preferably Greek style) and replace pepitas with some chopped red peppers or pomegranate seeds. no oven – just pan fry the fish in a little oil. About 4 mins each side on a medium high heat. carb lovers / more substantial – toss in some cooked brown rice, quinoa, couscous, barley or buckwheat with the spinach. more veg – serve with grilled veg such as zucchini, eggplant and/or red peppers. Or some sauerkraut on the side. carnivore – replace salmon with chicken thighs or pork chops. Adjust cooking time as needed. Video Version of the Recipe. How do you approach healthy eating? Do you focus on specific nutrients or calories? Or do you try eating for variety? Or real / whole food? Share your approach in the comments below. Oh I hate the midnight leg cramps! I don’t get them often but they are terrible. I have salmon, tahini and lemon! I’ll be substituting chard and walnuts for the spinach and pepitas! What?? Why have I never heard of this before? My toes cramp and I have to get out of bed and stand on them to get rid of it. I will definitely give this a try. My motto is “everything in moderation”. I don’t really have a forbidden foodlist but try to keep a varied diet. And yes real food whenever possible. Try to drink a glass of water before you go to bed. It is supposed to help with leg cramps in the night. I don’t know if it helps, but it might be worth a try. Fortunately, I don’t get leg cramps. Jules, take a bar of unwrapped soap and slip it under your bed sheet to prevent leg cramps during the night. More than an old wives’ tale, this reported in several columns to work. Just might work for you too! I think that ensuring having a whole range of foods, some raw, some cooked, and in moderate or sometimes modest quantities, automatically results in a healthy diet and consequently a healthy person. There may be times when a person is deficient in a particular nutrient and then it is appropriate to focus on ensuring that the nutrient is included in the diet. For example, dark chocolate would correct a need for iron and women of a certain age might enjoy a monthly fix. Women past a certain age (sigh) might just have a bit of choccky from time to time just to be sure to be sure. Life is for pleasure after all. I love to eat berries, strawberries, raspberries, blueberries, as a good source of magnesium. I always look at how to get my vitamins naturally first before taking supplements. Epsom Salts are a good source of magnesium so taking a bath with a cup full of epsom salts & a few drops of an essential oil is a good detox as well as the magnesium is absorbed into your skin. Being a super taster there are some foods I can’t eat or I have to be near a toilet or sink when I throw up. However, I eat or try to eat a lot of different foods. Being a caregiver to 2 parents, one whose on a feeding tube but can eat some foods, we don’t cook a real lot of food anyway. 75% of the time I eat healthy or at least try to. I’m not a very big eater either. I leave that to my sister who is a really big eater. I live in CT so we don’t have a lot of fresh food in the winter that isn’t from some other country far away. A lot of our fruits and veggies and I don’t mean the exotic fruits that need to be grown in a tropical climate don’t even come from the US never mind CT in our supermarkets. In the spring and summer when we have a farmers market, we always go to buy veggies and even grass fed beef. The orange carrots I bought at our farmers market last year were an orange color I had never seen in carrots in our supermarket before. They were beautiful! We ate some and they were delicious, and we froze some. Sometimes though I crave some mac and cheese or a pizza. I’m 61 and pretty healthy so if I crave something, I should be able to have it. I love cheese and fried chicken although I’m not that good at making fried chicken, at least not restaurant style fried chicken. I love corn and green and yellow beans and peas fresh from my garden and pasta and I agree that everything is better with bacon although I don’t eat it everyday, just sometimes. I can’t tolerate salmon though but I did pass your recipe on. Love the Magnesium ++recipe as I sometimes get cramp. I try to eat healthy but the male of the house does like meat! So we have that about once a week. Try to eat lots of greens so hopefully our diet is a healthy one. Loved your write up of which oil to use. Been reading a lot about the benefits of Himalayan (pink) salt. Any thoughts on that? Thanks again for the great ideas. You don’t take any magnesium supplement for your pregnancy? But i guess the salmon taste 100x better than those pills. Lol. I’m trying to increase our vegetable and fruit intake till it reaches the point that our diet is 80% plant based. I try to eliminate wheat and sugar, and use brown rice or quinoa for the “sticking to the ribs” aspect. If we are hungry again in the evening we try to keep the snacking down to cheese, nuts, olives or popcorn. I usually sweeten things with natural maple syrup or honey. We’ve started a new eating plan about 3 months ago and my wife has struggled with cramping in her feet and legs for years. It hasn’t been as bad since we’ve started our new plan because we’ve increased Magnesium, and we’re definitely going to have to try this recipe! We’ve been using chia seeds also to supplement magnesium intake which seems to help, but we’re always looking for ways to keep her from cramping. Thanks for the recipe! Great Cory… Curious to know how have you changed your eating plan? Looks delicious. Salmon is now on my grocery list for tomorrow. Thanks for sharing! I hope everyone is getting as much magnesium in their food as they thing they are. In the USA I’ve read that there is half the amount of magnesium in the soil now as there was 100 years ago. If it’s not in the soil it’s not in the crop. I haven’t read of similar studies being done in Australia or other places. I’ll end here though I could go on an on about Carolyn. I think it’s the same in Australia Gina.